Anyone interested in astronomy on the web will be aware of the fabulous success of Planetary Resources’ fundraising effort to build and launch the ARKYD space telescope. They’ve already raised more than a million dollars – helped in part by a cunning plan to let you take a picture of yourself in space – but they’re not stopping there. With three days to go, we’re delighted to announce that they’re going to try and help us help Zooniverse volunteers hunt for potentially hazardous asteroids. The latest stretch goal is to support the development by the Zooniverse of a citizen science asteroid hunt. If the new target is hit, we’ll build a system that uses more than 3 million images, taken data from the Catalina Sky Survey – the survey responsible for nearly half of the near Earth asteroid discoveries in the last fifteen years. We know there are asteroids out that are waiting to be discovered, and we’re willing to bet that the existing routines used to scan through the survey data didn’t find them all. Recent discoveries of near-Earth objects; Catalina’s the big purple part. Anyone who’s followed the Zooniverse over the last few years knows that we believe in doing projects that make authentic contributions to science, and so I’m especially pleased that the project with Planetary Resources is also focused on improving machine learning solutions to asteroid hunting. Rather like our supernova project, an ideal outcome would be to use the classifications provided by volunteers to improve automated searching and suggest new methods by which machines might take up the strain. In the meantime, though, there are new (small) worlds to find – with your help, we’ll be launching the search for them soon. I’ve put my money where my mouth is already, and if you can afford it then I hope you’ll follow the link and donate so we can all go asteroid hunting. You can also watch their Kickstarter video to see what they’re trying to do. So all in all, privatize space, to then cover the fact with lots of pretty ideals and pretty words that no one would refuse to fund like “promote education”, “we’re putting control of the telescope in YOUR hands”, “support important research and discovery”, but it’s not really what they’re into at all. What they’re doing is called “social marketing”, presenting their product a certain way to build some company capital, looking all good and ethical to investors, all the while promoting “private science” and appropriation of space resources. They have memberships, you get what you pay for… it’s not crowd-sourced, it’s pretty clearly a pay-per-use kinda deal. They might succeed at lowering the costs of space technology, but at what price?! I hate this project, I seriously do. This is not meant to help science or students or even amateurs, it’s a company’s pathetic attempt at shipping one telescope in space for free, while making their millionaire/billionaire investors feel good about themselves. To what extent, may I ask, do you share katsee’s concerns? Re astronomy: who is on the ARKYD TAC (telescope allocation committee)? And what commitments have they made concerning free and open access to all data and papers based on such data? I’m sorry you feel this way. The whole team at Planetary Resources has benefited from science education and engagement opportunities all along our career, and our Kickstarter project has allowed us to extend this unique opportunity to the public – leveraging what we’re already doing within the company, to create something that would cost much much more, or otherwise never happen at all. Individuals who have pledged to the ARKYD Kickstarter at levels which involves telescope time will have complete freedom to do what they want with the time and exposures. For the education levels which have benefits delivered to the classroom, the teachers or students will jointly decide, or choose from options identified by our observation team. For the remaining capacity of telescope time, we will be assembling a form of “Telescope Allocation Committee” comprised of Educators, Science Center and Museum representatives, as well as everyone who has pledged to the campaign. We’re also excited to allow our community to make frequent choices and vote how the telescope gets used over time. The data obtained by Kickstarter backers directly is at their discretion to share. Other data will be made available for open public use, potentially after an embargo period to give deference to supporters and partners on the project. And for my own part, I’ll reiterate what I said in the post. The Zooniverse exists to do science, and if there wasn’t a serious scientific goal at the end of our engagement then we wouldn’t be involved. I searched the ARKYD website – from the link in Chris Lintott’s blog post – and could not find text that matches what you wrote here. Of course, I may have missed it, so would you be kind enough to share the relevant URLs? May I ask, when do you expect to do this? And will you require that the TACs decisions be made public (or at least available to all relevant kickstarters)? When will you make public details of the instruments and science operations? I am particularly interested in the ‘digital depth’ of the camera (cameras? ), and how raw downloaded data will be processed and formatted as FITS files before being distributed (I assume there will be no ‘on-board’ processing). I’m just curious; what is the expected start date for Asteroid Zoo (i.e. when we can start using it)? It will likely begin development this year. I’d imagine it will be public in 2014 – but I’m sure we’ll keep people up to date. As I understand it, the deadline has come and gone. And it may have been met, but I’m not really sure. Do we now have an Asteroid Zoo in the pipeline? If so, CONGRATULATIONS! I’m sorry to anyone my above “comments” might offend, they were cross-posted here from a forum post before I moved and went on vacation, and were said in another context, and well, I don’t think they have the appropriate filter for Chris’ blog post. That being said, I still endorse what I said then, even if I would’ve preferred a less radical presentation, and the freedom (since it was a topic in the response) to formulate that thought differently. I’m still very fond of the Zooniverse, and I don’t question the motives and intentions of the Zooniverse people. In fact, if Zooniverse needs to fund more scientific projects, I think Kickstarter and the likes is a good platform, and I strongly encourage anyone with means and a passion for animals on the internet (brushing large!) to help out in the campain to keep Snapshot Serengeti up and running! 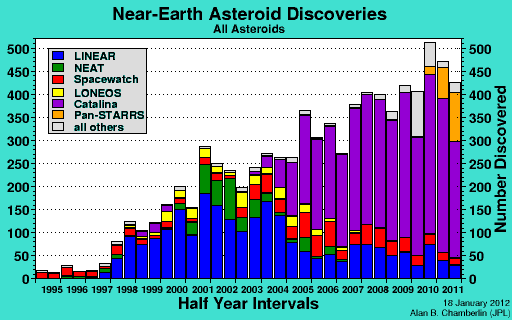 The science was never an issue, what bothers me is the fact that we’ll be searching for “potentially hazardous asteroids”, while it’s really “potentially mineable asteroids” at the PR board meetings. To me it’s a matter of principles: how far are we willing to promote individual freedom of choice? I don’t mean to be subversive, but the main objective of this company is mining, and profit, and any scientific outcome will only legitimize their claims to a free-market version of space exploration. Zooites looking for “potentially hazardous asteroids” will be helping private space exploration and appropriation of space without really even realizing it. Those people who pledged money will hang their space selfie up on the wall and never realize that while they thought they were encouraging honest science and “the people’s telescope”, they were encouraging the same kind of for-profit mining business than those we have here on Earth. We can’t even keep those in check, for our own sake, so I don’t especially look forward to for-profit space mining. And that, I can’t apologize for. I remember an anecdote that astronomer Hubert Reeves recalls in his memoirs. He was a young french-canadian man in Northern Canada, working on a student job as a chemist for a mining company. His job was to analyze the amount of iron ore in mineral samples he was given. Years later, he realized that the Iron Ore company of Canada, the company he helped analyze samples for, was given a 10-year contract to mine, and so they had a “rush program” to plunder as much of our natural ressources at low cost as they humanly can. The aftermath was tragic, and the contract was a scandal in my home province. He recalls (free translation by yours truly): “This lab allowed me to acknowledge a reality that, in my naivety, I didn’t foresee: that of science being at the service of industry and profit.” What worries me and angers me is the instrumentalizing of legit scientific projects, run by well-intentioned scientists, to advance free-market goals. There are politics involved in those types of projects: who gives out the contract to mine an asteroid? Who “owns” the ressources? I fear a future “space cowboys” race of the “if you can get to it and bring it back, you deserve it, it’s yours”-type, wrapped in a pretty publics relation campaign. Of course I can’t be against educators and museums using a telescope “of their own”, but that’s a non-issue for me if the people providing them the telescope own it privately, and are using it to build social capital for space mining. I wouldn’t go as far as comparing it to Project Manhattan, but in terms of alternate agenda, I almost could, only Planetary Ressources are not exactly hiding their ultimate goals, and I guess that’s one thing I can commend. I do believe that the science coming out of the new Zoo will be of scientific value, but I can’t help but think it’s a key link in a chain of events I can only frown upon. My inner environmental sociologist is waving a triple red flag when I read that “Planetary Resources is establishing a new paradigm for resource discovery and utilization that will bring the solar system into humanity’s sphere of influence.”…. I’m for limiting our sphere of influence, not enlarging it. We are way too flawed still to inflict our will on the rest of the universe, it’s like tasking an adolescent to conceive a building when all he’s really ever built is a fort in the backyard. That’s why I also don’t really think that “freedom” should be the ruling voice in space telescope time allocation (althought it makes for a great leitmotiv for PR), a rare ressource that would undoubtedly be put to better use if prioritized by scientific value, not by how much you’re willing to pay. I don’t think scientists turning to private telescopes would enjoy market effects on their observation costs down the line: this economicization of anything and everything has to stop somewhere. Budgets are being slashes in the public system right now, but I don’t believe in the private sector as a viable alternative: it will only prove to the budget slashers that they were right to slash, free-market fundamentalists will keep lobbying until that happens, and fundamental science will suffer a forced hunger strike budget-wise. I believe space is a common ressource, not a private one. So is science, that’s why I enjoy citizen science, because knowledge is humanity’s greatest ressource, and the only ressource I ever want to mine. I can only speak for myself when I say that I won’t partake in the Asteroid Zoo, for ideological and ethical reasons, but yet again, I wish to apologize for my raw critique quoted by Jean above, the circumstances were quite informal and didn’t allow me to elaborate then, and I hope this isn’t seen as a conspirationist-type rant or a personal attack on any PR person at Planetary Ressources (I’m sure you’re very good at your job, sir, and don’t think too often about neoliberal space takeover! ), but only felt that it needed to be said that this project is not politically neutral.